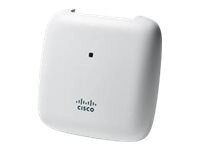 With more transmit power than the other access points in its family, the Cisco Aironet 1815m Series supports a larger coverage area with fewer access points. In addition, the 1815m delivers industry-leading wireless performance with support for the latest Wi-Fi standard, the IEEE’s new 802.11ac Wave 2 standard. The 1815m Series extends support to a new generation of Wi-Fi clients, such as: smartphones, tablets, and high-performance laptops that have integrated 802.11ac Wave 1 or Wave 2 support.